Every year, TNI publishes a State of the Power report, which this time has the central theme of building ‘counter-power’. This volume contains many gems; every article brings new material about the evolution of social movements, with special attention this year to the commons as an expression and experience of counter-power (see the article on water governance in Mexico, the one on Madrid’s community gardens, the one on indigenous territorial self-defense movements in Latin America…). This piece by Raúl Zibechi was originally published on TNI Longreads. In much of Latin America, the state does not protect its citizens. This is particularly true for the popular sectors, indigenous peoples, people of colour and mestizos, who are exposed to the onslaught of drugs trafficking, criminal gangs, the private security guards of multinational corporations (MNCs) and, paradoxically, from state security forces, such as the police and the army. There have been several massacres in Mexico, for instance – such as the killing of 43 students in Ayotzinapa in September 2014 – and they are no exception. There continues to be impunity for the 30,000 who have disappeared and 200,000 who have died since Mexico declared its ‘war on drugs’ in 2007. Slight differences aside, the current situation in Mexico is replicated across the region. In Brazil, 60,000 people meet a violent death every year, 70% of them of African descent, and mostly youths from poor areas. Against this backdrop of violence that threatens the lives of the poorest, some of the most affected have created self-defence measures and counter-powers. Initially, these are defensive, but ultimately develop power structures in parallel to the state. Since they are anchored in community practices, these self-defence groups are key to forming a form of power that differs from the hegemonic powers centred around state institutions. This essay examines them in more detail in order to understand this new trend in Latin American social movements. The logics of the state and the community are opposed, since the former rests on its monopoly of the use of legitimate force within an established territory, and on its administration by means of a permanent, unelected, civil and military bureaucracy that reproduces and is answerable to itself. The bureaucracy brings stability to the state because it survives any change of government. Transformation from within is a very difficult, long-term process. Latin American countries face an additional challenge: state bureaucracies are colonial creations, made up principally of white, male, educated elites in countries where the population is mostly indigenous, mestizo and black. By contrast, the community logic is based on rotating tasks and functions among all of its members and whose highest authority is the assembly. In this sense, the assembly, as a space/time for decision-making, is a ‘common good’. However, we cannot reduce ‘common good’ to the number of hectares of collective property, buildings, and authorities elected by an assembly that can be manipulated by caudillos or bureaucrats. We need to understand that there is the community as an institution and the community as social relations, a fundamental difference in dealing with questions of power. In my analysis, the heart of the community is not common property, although it remains important, but collective or communal labour – minga, tequio, gauchada, guelaguetza – which should not be reduced to institutionalized forms of cooperation in traditional communities. Collective labour underpins the commons, and is the true material base that produces and reproduces living communities, based on relations of reciprocity and mutual help rather than the hierarchical and individualized relations at the core of state institutions. Collective labour underpins the commons, and is the true material base that produces and reproduces living communities, based on relations of reciprocity and mutual help rather than the hierarchical and individualized relations at the core of state institutions. The community lives not because of common property, but because of collective labour that is creative, and is re-created and affirmed in everyday life. This collective work is the means through which the comuneros and comuneras make a community, expressed in social relations that differ from the hegemonic ones. In her sociological work, the Guatemalan Mayan, Gladys Tzul, argues that in a society based on common labour, there is no separation between the domestic environment, which organizes reproduction, and political society, which organizes public life. In reality, both feed and nurture one another. In the communities, the two spheres are complementary, embodied in communal government. Collective labour is part of all community activities. It enables both the reproduction of material goods and the community as such, from the assembly and feasts to funerals and wakes, as well as alliances with other communities. Resistance struggles that ensure the reproduction of community life are also anchored in collective labour. Emphasizing the multiple forms of collective labour allows us to see power and counter-power from a different perspective. First, collective labour is not an institution but social relations. Second, because they are social relations they can be produced by any collective subject in any space. As they are distinct from the community’s property relations and authorities, they can reappear wherever the subjects or movements engage in community-inspired practices. The Venezuelan communal councils depend on state funding and speak the language of bureaucracy; they form part of the organizational structure of the state and help to secure it rather than transcending it. Over time, they have become increasingly homogeneous and lost their independence. Although there is a strong egalitarian culture in the popular neighbourhoods in Venezuela, of horizontality and the absence of hierarchy, the contradiction between the base and the leadership has been resolved through directives that have set limits to and controlled egalitarian spaces. An important barrier to emancipation is that, to a greater or lesser degree, every culture has features of a hierarchical culture which feed on patriarchal and machista relations. This is equally true of indigenous and Afro-descendant communities, where caudillismo, personalism and paternalism are reproduced almost ‘naturally’. I therefore believe to put the emphasis on how social linkages are expressed in ‘collective labours’ more broadly, from assembly to feast. 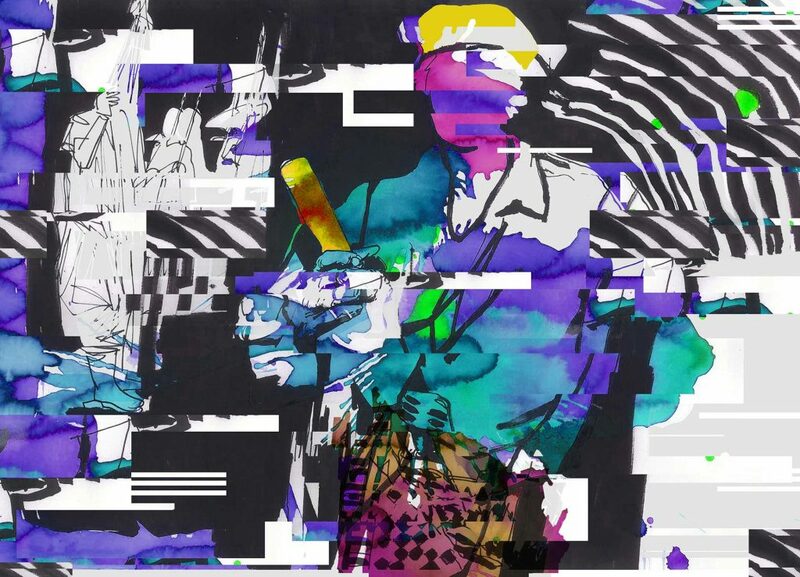 It is in this form of life and creative work that it becomes possible to modify cultures and ways of doing things, rather than within institutions whose inertia reproduces oppression. Counter-power is, in fact, collective work that rural and urban communities establish to defend themselves from superior powers that jeopardize their survival. Below I list some examples of experiences where popular collectives or communities have exercised anti-state powers. In cities, like Cherán and Mexico D.F., counter-powers are enmeshed in territorialized social movements that control and defend common spaces. They show that there are many similarities between what happens in a rural indigenous community and in a popular peri-urban area. In both cases, their collective life is challenged by extraction and capitalist accumulation through dispossession: in rural areas hydroelectric dams and open-pit mining in rural areas, and in the cities by real-estate speculation and gentrification. The colourful mobilization of the Nasa people in the Colombian Cauca mountain region features a cordon of guards, both leading and flanking the mass of comuneros and comuneras to protect them. They are disciplined and ‘armed’ with their wooden sticks marked with ancestral symbols. The Indigenous Guard, the Guardia Indígena, says that its aim is to protect and defend the communities, as well as to be a body for education and political training. 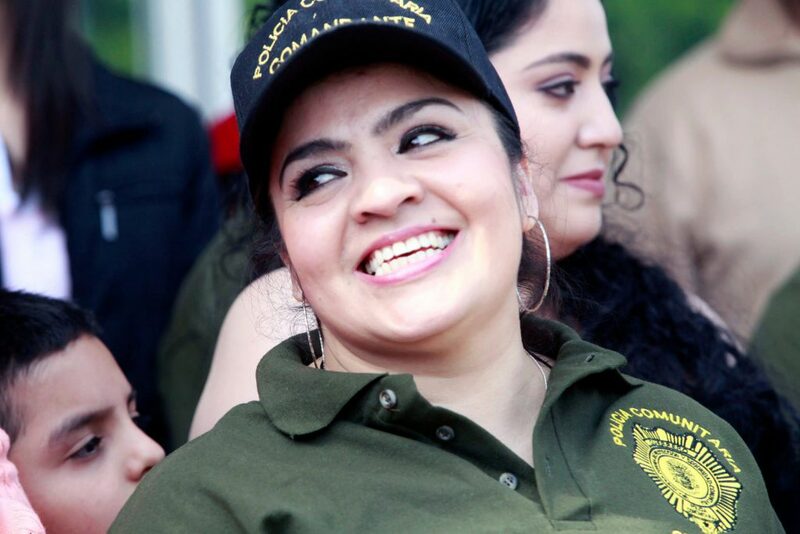 Every year there is a graduation ceremony for hundreds of guards in the North Cauca. Men, women and young people from 12 to 50 years of age participate in the Escuela de Formación Política y Organizativa (School for Political and Organizational Training), and receive instruction in human rights and ‘indigenous law’ that they must apply in performing their duties. The graduation is a deeply mystical act that takes place in a harmonization centre, guided by wise community elders alongside university professors and human rights defenders. Children, young people, adults and seniors begin the second day of the sixth meeting of indigenous guards with a tribute from the student body of the Yanacona Farming Institution to the visitors of the Nasa people. The structure of the Indigenous Guard is simple and shows its true purpose: each vereda or community chooses ten guards and a coordinator. A second coordinator is then chosen for each resguardo or indigenous territory, and a third for the entire region. The North Cauca region has 3,500 Indigenous Guards, corresponding to the 18 cabildos or authorities elected by the resguardos. ‘We are not a police force at all, we build organization, we provide protection to the community and defend life without getting involved in the war’, explains one of the coordinators. Participation is voluntary and unpaid, and the authorities and neighbours in each community help with the upkeep of the family plot of each guard and sometimes carry out sowing and harvest mingas (collective work). Guards are evaluated annually, with members either continued or replaced as the organizational model is based on rotating among all its members. Community justice – the main task of the Indigenous Guard – seeks to restore internal balance and harmony, based on the Nasa cosmovision and culture, as opposed to state justice that separates and locks away convicted criminals. The Guard defends its territory from the military, paramilitaries and guerrilla forces that have murdered and kidnapped hundreds of comuneros since the war began. In recent years, they have also protected their territory from the multinational mining companies that pollute and displace populations. As well as training and organising the communities, the guards encourage food sovereignty, and promote community plots and gatherings to reflect on derecho propio, as community justice is known. Every six months, they take part in harmonization rituals, guided by traditional healers, as a form of collective and individual ‘cleansing’. The Indigenous Guards are characterized by peaceful resistance. On several occasions, hundreds of them have convened, responding to the traditional whistle, to rescue someone kidnapped by the narco-paramilitary or the guerrilla forces. The sheer number of disciplined and determined guards free victims without recourse to violence. At times, they have also faced down the armed forces. In 2004, the Indigenous Guard received the National Peace Prize, awarded every year by a group of institutions, including the UN and the Friedrich Ebert Foundation. The Guard has become a point of reference for other peoples, such as Afro-descendants, peasants and the popular sectors that suffer state or non-state violence. Nasa’s Indigenous Guard is not an exception, as many Latin American movements have established forms of self-defence to protect their communities and territories. The advance of extractive industries in recent years, whether mining companies, monocultures or infrastructure, is being met with popular resistance everywhere, sometimes taking the form of community-based territorial control. To explore the forms self-defence takes and their relation to counter-powers, I will briefly describe four cases in addition to the Indigenous Guard: the Rondas Campesinas in Peru, the Community Police in the Mexican state of Guerrero and the Cherán fogatas in the state of Michoacán, and the Acapatzingo Housing Community Brigades in Mexico City. In the 1970s, the state in practical terms did not exist in remote rural areas of Peru, which left peasants exposed to cattle rustlers. These were very poor and fragile cattle communities in the highlands, and any theft posed serious threats to their subsistence economy. 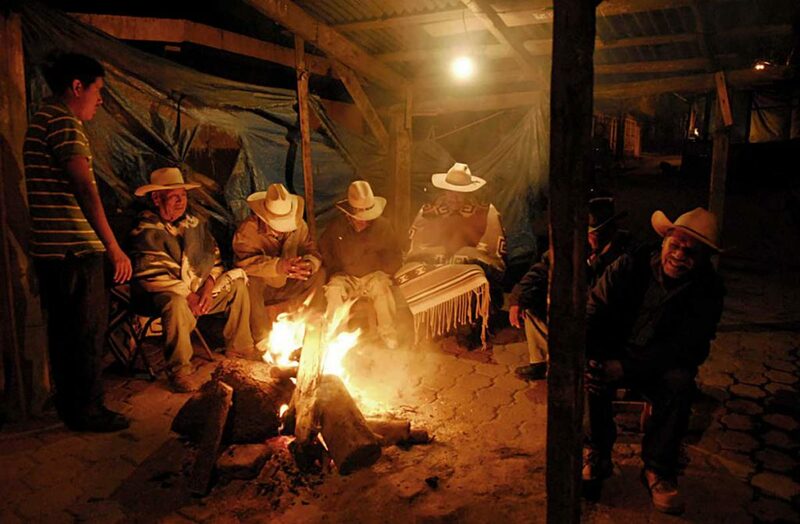 The communities therefore formed an assembly and decided to establish night watches or Rondas Campesinas to guard against cattle rustlers and protect the communities. At first they organised night watches by rotating responsibility among everyone in the community, but then they started carrying out public works, such building roads and schools. Later on, they even started to impart justice, acting like local authorities. The Rondas came back to life in Cajamarca in northern Peru, against the Conga gold-mining project. They sought to protect the water sources, on which family agriculture depends, from the pollution caused by the mine. 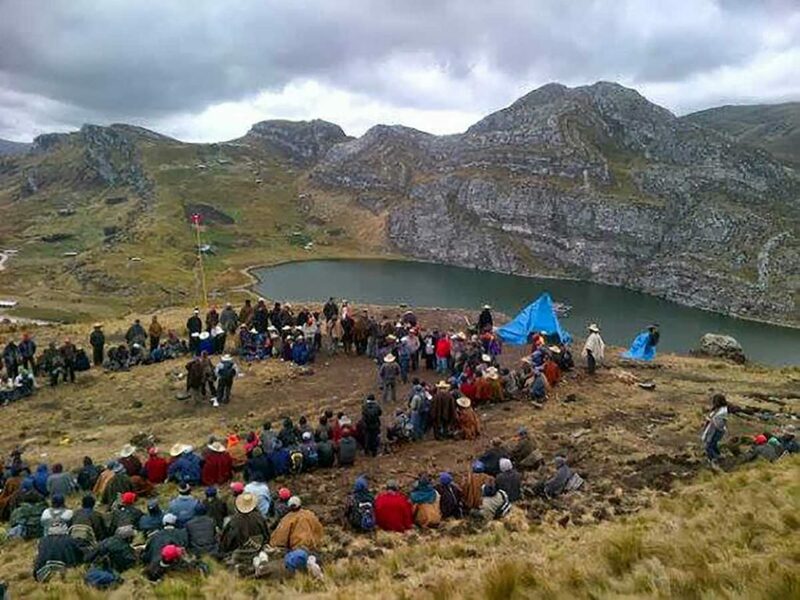 They call themselves Guardianes de las Lagunas (Guardians of the Lagoons), and camp at an altitude of 4,000 m. in barren and almost uninhabited terrain, to watch over, witness and resist the presence of the multinationals. The Regional Coordination of Community Authorities–Community Police (Coordinadora Regional de Autoridades Comunitarias-Policía Comunitaria, CRAC-PC) was born in 1995, when indigenous communities sought to protect themselves from rising criminality. Twenty-eight communities were part of the initial effort, and managed to reduce delinquency by 90–95% https://www.youtube.com/watch?v=cJm0XiJo6lk. Initially, they would hand over the offenders to the Public Prosecutor. But, after seeing them back on the streets after a few hours, in 1998 a regional assembly decided to create the Houses of Justice (Casas de Justicia). The accused can be defended in their own language, without the need for lawyers or the imposition of fines, since the aim of community justice is to ‘re-educate’ those found guilty. During the trial, the main goal is to reach an agreement between the parties, involving family members and communal authorities. This ‘re-education’ is carried out mainly through community work rather than punitive justice, because the goal is the transformation of the person under community supervision and monitoring. The highest authority of the CRAC-PC is the open assembly in the towns that have Community Police. The assemblies ‘appoint their coordinators and commanders, and can relieve them from their post if they are accused of failing to fulfil their duties. Also, decisions are made related to justice in difficult and sensitive cases, or if it is important business that involves the organization’. The CRAC-PC has never generated a vertical, centralized chain of command, showing that community authorities function as different kinds of powers than state authorities. After 2011, Community Police spread throughout the state of Guerrero and the country as a whole, partly due to the growing levels of state and narco-trafficking violence, and the de-legitimation of the state apparatus. In 2013, self-defence groups emerged in 46 of the 81 municipalities in Guerrero, involving some 20,000 armed citizens. There are considerable differences between community police and self-defence groups. The latter are citizens who spontaneously take up arms to defend themselves from criminal activities, whose members are often neither appointed nor fully accountable to the community and where regulations or basic principles are minimal. Their rapid expansion came about because of the growth of indigenous self-defencein the wake of the 1994 Zapatista uprising. This was recognized in the Ostula Manifesto of 2009, approved by indigenous peoples and communities in nine Mexican states during the 25th Assembly of the National Indigenous Congress (Congreso Nacional Indígena, CNI), that established the right to self-defence. Cherán is a city with a population of 15,000 in the Mexican state of Michoacán, most of whom are indigenous purépecha. On 15 April 2011, the population rose up against talamontes, loggers, in defence of the common use of the forests, their community life and to ensure their safety from the organized crime and the political powers that protect it. Since then, the population has set up a system of self-government through 179 braziers or community fires, the beating heart of indigenous counter-power, located in the city’s four neighbourhoods https://www.youtube.com/watch?v=Dql9_kKBwws. Based on their usos y costumbres (customs and traditions), the population elects a High Council, the highest municipal authority, which is also recognized by state institutions. There are no more elections by parties, but rather via assemblies that choose their authorities. The braziers are an extension of the communal kitchens among the barricades; a space for neighbourhood gatherings, exchange and discussion, where ‘children, youth, women, men and the elderly, are actively included and where all decisions are made’. Communal power in Cherán is best depicted as a set of concentric circles. On the outside are the four neighbourhoods, in the centre of which is the Community Assembly backed by the High Council of Communal Government, which includes three representatives from each neighbourhood. Then, there is the Operational Council and the Communal Treasury, which form the first circle around the centre/the assembly. Around it, there are six other councils: administration, communal goods, social, economic and cultural programmes, justice, civil issues, and the neighbourhood coordination council. As they say in Cherán, this is a government structure that is circular, horizontal and articulated. 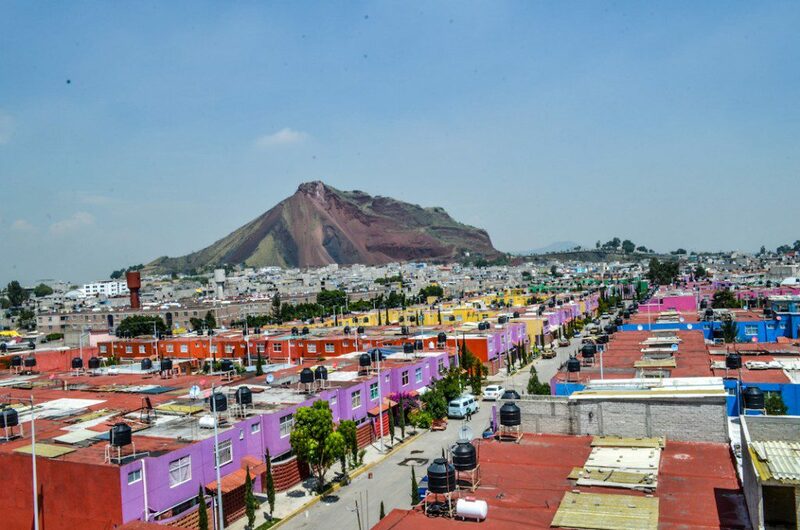 The Housing Community of Acapatzingo includes 600 families in the south of Mexico City, with a population of 23 million. It belongs to the Organización Popular Francisco Villa de la Izquierda Independiente (Popular Movement Francisco Villa of the Independent Left). It is the most consolidated popular neighbourhood in urban Mexico, based on the criteria of autonomy and self-organization. Brigades, in which 25 families are represented, form the basis of the self-organization. Each brigade appoints representatives to committees, generally four: press, culture, public order and upkeep. Participants rotate and they appoint representatives to the General Council for the settlement, where representatives from all brigades convene. The public order committee also has a role in determining the community’s boundaries, deciding who can enter and who cannot. This is a central aspect of autonomy, perhaps the most important. When there is violence in the home, the children go out into the street sounding their whistle, a device also used if there is an emergency. The atmosphere in the community is so peaceful that it is common to see children playing alone in absolute calm, in a safe space, protected by the community – something unthinkable in the otherwise violent Mexico City. This essay has focused on Latin America, although the experiences are not exclusive to the Global South. In the aftermath of the 2008 crisis, there has been similar territorialization of resistance and collective projects, particularly in Greece, Italy and Spain. Azienda Mondeggi, for example, close to Florence in Italy, has been taken over by scores of young people, whose produce includes wine, olive oil and honey. They live in collectives and have managed to recover several hectares as ‘common goods’. Another notable collective territory experience is the resistance to the high-speed train in northern Italy, the No-TAV movement in the Susa Valley. In the Spanish city of Vitoria, the youth of popular movements have recovered an entire neighbourhood, Errekaleor, that they defend from real-estate speculation. As a general rule, social movements are counter-powers that seek to bring balance or present a counterweight to the large global powers, such as MNCs and the states that work with them. Often, these counter-powers act in a way that imitates state power, with similar hierarchies even if they are made up of individuals from different social sectors, ethnicities and skin colours, genders and generations. Counter-power is usually defined as seeking to displace hegemonic power, but is often constituted in a similar manner to state power as we know and endure it, at least in western societies. This is not to enter the theoretical debate about power, counter-power or anti-power, as argued by Toni Negri and John Holloway respectively. However, I believe that the main problem is that these arguments ignore the Latin American reality, where families, rather than individuals, participate in social movements. (When you go to an indigenous community, a landless farmer settlement, or a camp of homeless and jobless, you will always be told ‘we are so many families’). This takes us back to the community, not an essentialist understanding of the community as an institution, but rather one based on strong, direct, face-to-face relationships among people whose daily life is closely intertwined. The proposals of the left for ‘counter-power’ are always marked by an underlying temptation to become a new power, constructed in the image of the state. The historical example would be the Russian soviets or the Committees for the Defence of the Revolution (CDR) in Cuba, which gradually became a cog in the state apparatus, subordinated to the state and institutionalized. There is a need to discuss concrete experiences because, in the reality of communities that resist, constructed power (whether a form of self-defence or ways to exercise power) comes from an entirely different source than those that dominate the great revolutions or within social movements. In hegemonic political culture, the image of the pyramid inspired by the state and the Catholic church is constantly reproduced in political parties and unions, with amazing regularity. Controlling power happens at the apex of the pyramid, and all political action channels collective energy in that direction. 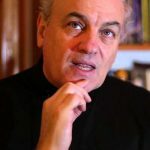 There are, however, distinct traditions in which communities channel all their energy into avoiding having powerful leaders, and that reject state-types of power, as French anthropologist Pierre Clastres’s work has shown. A community is certainly a form of power that includes power relations, but its character differs from that of state power. Elders’ councils or appointed and rotating positions are transparent powers, under constant collective control. This means they are not autonomous forms of power; they cannot exercise power over the community, which is a characteristic of the state with its non-electable community, separated from society and standing above it. In discussing such types of power, we need to differentiate them from other forms of exercising power – which is why I refer to them as non-state-powers. Perhaps the best-known cases are the Juntas de Buen Gobierno (Councils of Good Government) in the five Zapatista regions or caracoles. Women and men are equally represented in the councils and are elected from among hundreds of members in the autonomous municipalities. The entire government team – up to 24 people in some caracoles –changes each week. This rotating system, as the Zapatista community members explain, gradually enables everyone to learn how to govern. The rotation is carried out at the three levels of Zapatista self-government: within each community by those who live there, within each autonomous municipality through delegates who are elected, rotated and whose mandate can be revoked, and within each region at the level of the Council of Good Government. More than 1,000 communities, 29 autonomous municipalities and some 300,000 people are governed through this system. Two things are worth noting on the experience of the Zapatista Juntas de Buen Gobierno. First, this is the only case in Latin America where autonomy and self-government are expressed at three different levels with the same logic of assembly and rotation as in the community. Of the 570 municipalities in the state of Oaxaca, 417 are governed by an internal democratic system, known as ‘usos y costumbres’, or customs and traditions, by which Oaxacans can elect their authorities in a traditional manner, through an assembly and without political parties. But even this extensive case of self-government only got as far as the municipal level. The second characteristic of the Zapatista autonomy is that it does not create bureaucracies, because the rotation system disperses them, avoiding the formation of a separate, specialized body. Something similar happens in Cherán, among the Guardia Indígena en Colombia and the Guardianes de las Lagunas in Peru. In the Colombian case, the cabildos govern a territory or resguardo, similar to the Zapatista regions. Nevertheless, state involvement through education and health projects, and, especially through state funding of the cabildos, has led them to become more bureaucratic, although there are counter-trends such as the Guardia Indígena, the heart of power for the Nasa people. The importance of these non-state-powers, among which I include the different forms of self-defence mentioned above, stems from the double and complex dynamic at play in social movements throughout Latin America. On the one hand, they interact with the state and its institutions, as all other movements throughout history have done. This is a complex and changing relation that depends on each country and political reality. They resist the state and the large companies; they make demands, negotiate and often get their demands met. This is typical of unions and most other movements. Around 70% of Latin American cities, for example, have effectively been ‘seized’ as rural migrants set up their homes, neighbourhoods and social infrastructure such as schools and health and sports centres. Many of these illegally occupied spaces are legalized by the very institutions that offer them public services. Many others, however, are repressed. Many are made up members with different goals, such as creating different ways of living, or ‘other worlds’ as the Zapatistas put it. They become ‘territories of resistance’ that may even move towards ‘territories of emancipation’, in which women and youth play a large role. All these experiences need to be defended. They are not exceptional. One such experience emerged towards the end of last year in the Brazilian city of São Bernardo do Campo in São Paulo where 8,000 families or about 30,000 people have been camping in an urban area. This is the Pueblo Sin Miedo settlement, supported by the MST. Drone footage of a giant occupation in São Bernardo do Campo. They need water, food and sanitation services every single day. But they also need to defend the space (several neighbours have tried to shoot them), they need to create forms of decision-making and of problem-solving for everyday issues. They have established internal regulations to guarantee safety and teamwork. So, they have created an internal coordination system, to elect their members and support them every day for months at a time. This is the seed of counter-power or of non-state power. There is no fixed path. Each concrete experience must take whatever path it can, or the path its members choose. Raúl Zibechi is a journalist and researcher linked to social movements in Latin America. As a popular educator he conducts workshops with social groups, particularly in urban peripheries and with peasants. He has published 18 books, almost all about concrete experiences of social movements. Three of his books have been translated into English: Dispersing power, Territories in resistance and The New Brazil (AK Press). He publishes regularly in La Jornada (Mexico), Gara (Spain) and other alternative media.